As I said on my sister blog, I’m taking a summer hiatus, just like your favorite TV show. and as I said here, I wanted to make myself healthier, and I’m getting there. insofar as physically healthier, I’ve cut out (mostly! sometimes I still cheat a little) wheat and dairy. and I’m taking thyroid meds twice a day now so my energy has returned. I’ve concentrated more on my own yoga practice instead of thinking about my classes, thinking about what I’m going to teach. frankly, when I teach, I channel asanas, hard to describe I know, but that’s me. of course a teacher still has to think about how they will run a class, but if you don’t feed yourself first with your yoga, how can you feed your students? my back issue that I’ve been dealing with since last October is being resolved through the work of an awesome chiropractor I found who is not your typical bone-cracker. I’ve never been down with the whole chiropractic idea of someone cracking your neck and everything will be fine. my chiropractor deals with the soft tissue first, so my back right now is about 60-70% better after 5 visits. and in two weeks I leave for Spirit Rock Meditation Center for the second retreat of my Mindfulness Yoga and Meditation Training. I can’t wait because it is such a fabulous program and I feel blessed for being a part of it. talk about being fed. we got an email that Judith Lasater will do two days of teaching on restorative yoga. she is only one of the great teachers that I will experience. so you know I will have to blog about that. however, before I get to Spirit Rock, I’m spending about 4 days with my California gal pal. she’s picking me up at the airport and we’re immediately hitting an Indian restaurant for breakfast and to pick up food for our sojourn in the Carmel valley. she got us a room with a kitchenette in a funky little motel that is Sideways style. she has scheduled us for massages at Esalen and we’re hitting the hot springs at Tassajara and we’re going here for some cool shopping. all along the way, we’ll do a little wine tasting, a little art viewing, and talk a lot about Ma India since my friend will be making her 8th trip in the fall. last but not least, I’m planning my 4th trip to India and I’m putting my intentions out into the universe that it will be a 6 month trip. it’s part of my unending, soulful need to migrate home to Ma India (thanks for those words, sistah sita!) I returned from my last trip sicker than an Indian street dog, but as soon as I started to regain my strength I was dreaming those India dreams again. the first month will be spent studying yoga therapy at an ashram outside of Mumbai, then after that….I blow with the wind. whatever happens, happens. I’m a woman of a certain age and I try to live my life by asking myself, “if not now, when?” the trip will culminate in the Kumbh Mela at Haridwar in 2010. me, and 40 million of my closest friends all caught up in the power of shakti. life is good. 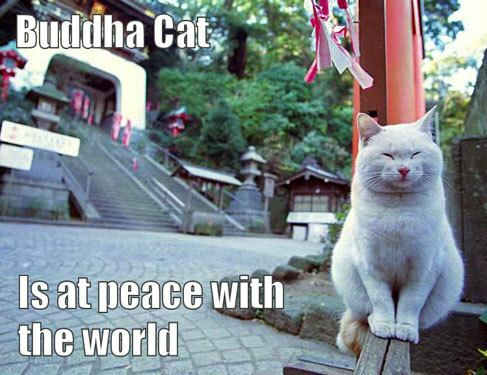 in the meantime, enjoy the buddha cat. I am so glad to hear your update. It sounds like many good things are coming into your life!! Thanks for dropping in. Will be interesting to hear how the retreat goes, if you have the time or inclination. Linda, I hope you have a wonderful time. I thought you had already started your hiatus. I’ve been spending MUCH less time on blogging/blog-reading, which is good, but then I miss things. 😦Love! I save every nickel and dime I make from teaching yoga, and I also get a huge IRS refund. Dear Lydia,Let me tell the whole story. I remembered reading your blog a couple of months back and remembered to check back. Google search of “Lydia Yoga Blog” found you right away. As usual the writing was evocative about yoga and Buddhism, visit to Mysore, wait-a-minute, you have boy friend now, when did this happen, you broke my heart!! Quickly I realized my mistake and searched for Linda to get back to you. Another similarity – both of you quote Rumi. Any way have a great summer break and come back with your musings. I’ve got Lydia till then 🙂Have a great time Linda..